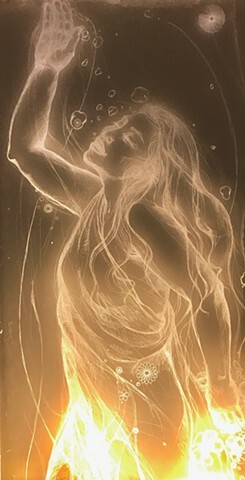 "Through the Waters" is a large LED-lit clear etching on acrylic, free standing in a maple base. This view is seen in daylight with LED in an unlit room - other views are with etched lines as a cast shadow against the wall via front track lighting; as white lines backlit by natural lighting at a window; and in full LED in a darkened space. With installation many viewing possibilities may be incorporated.